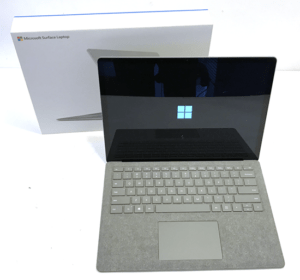 OK so we have all been paying attention to the Microsoft line up of 2-in-1 Surface devices and for the most part, we are pretty happy with them. Some are considered too expensive given their performance. But there will always be the people who like the “New Shiny” thing, whatever it may be. 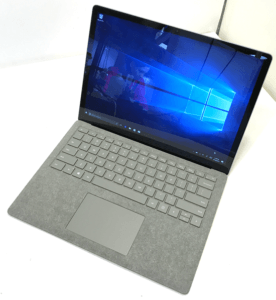 Today, I am going to talk a little bit about the new Microsoft Surface Laptop. Not to be confused with the new Microsoft 2-in-1 tablet device. So, we all want to know: is it worth it? 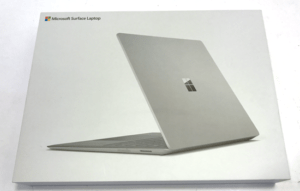 What is the Surface Laptop like to use? 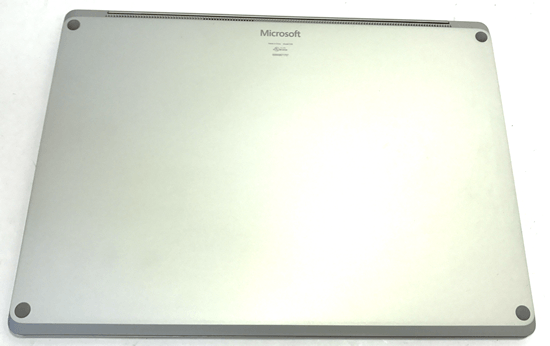 Microsoft has been making Surfaces for quite a while, but they’ve definitely had never done a laptop quite like this. There’s the Surface Pro, which is a bit more like a tablet. Also, there’s a Surface Book, which is kind of like a laptop, but it also is detachable and it’s a little bit unwieldy. 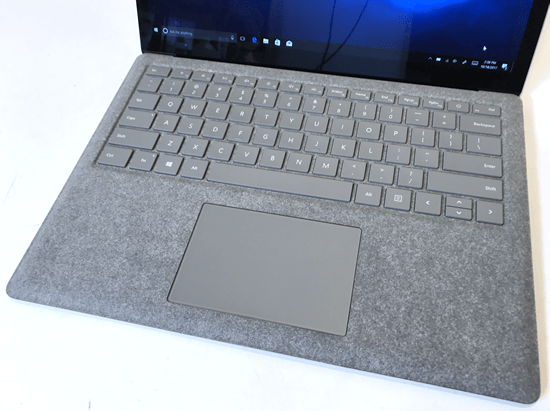 Whereas this Surface Laptop is a proper, honest-to-goodness laptop. Inside the box, you get the power adaptor. A cool feature about this adaptor is that it also has a USB port. This opens up other avenues of charging other items, like a phone. My first impression of this laptop is that feels like a really high-end piece of hardware. Unlike previous Surfaces which were made out of magnesium, this one is all aluminum and it feels awesome. When you look on the inside, at the keyboard deck, you’ll see that instead of having a metal cover for the keyboard, it’s actually lined with an Alcantara fabric finish. What this allows Microsoft to do is offer some really cool looking colors. Aside, from the regular platinum color, there are also some super cool looking colors like burgundy, cobalt blue, and graphite gold. The Alcantara fabric finish really does look nice, but does it hold up long term in terms of usage? 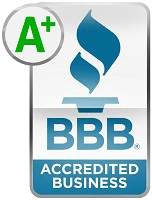 Obviously, with your palms and hands resting on it all of the time, there is probably no way to get the regular wear and tear type of staining. Now, that’s not a huge problem. But unlike the Surface Pro 4 keyboard where you can replace it completely when it gets damaged, it seems that you are stuck with this one cover and that’s it, short of replacing your keyboard deck entirely. As a comparison laptop, I used the LG Gram . The Gram is a very lightweight laptop and that is nice. That’s certainly not the case with the new Surface laptop. That’s not exactly a huge downside. The extra heft that it has makes it feel like a very premium product. But it will also weigh a little bit extra in your bag. 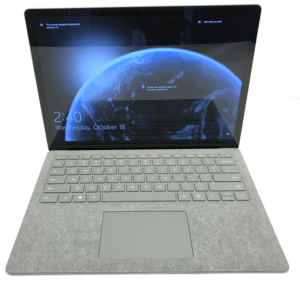 An issue that is almost impossible to avoid with this Surface hardware is the lack of ports. 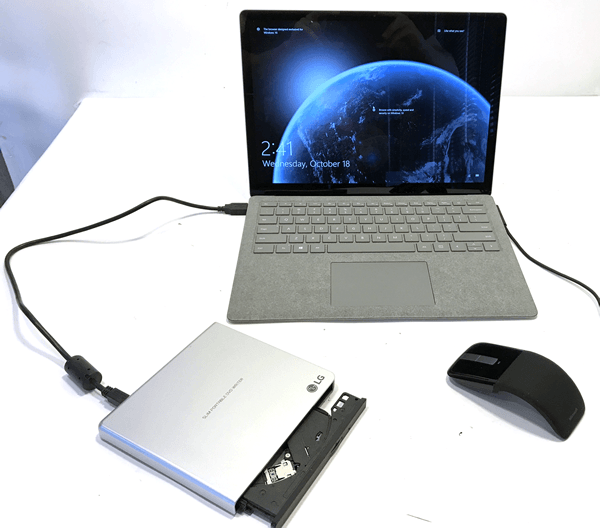 On the right side, all Microsoft gave us is the magnetic Surface Connector. It is mostly used for charging or docking it. Along the other side, the only other ports they gave are, a headphone combo jack, a mini DisplayPort, as well as a USB 3.0. There are no USB-Cs, no Thunderbolt, and only the single USB port. It would be nice if there were a little bit more. Especially on a high-end laptop that this is supposed to be. 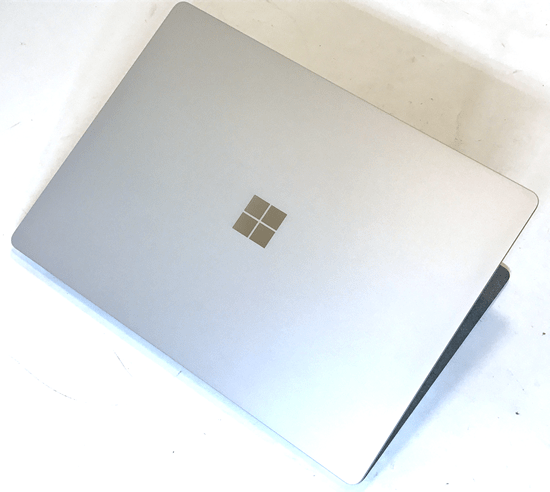 The big elephant in the room with the Surface Laptop is Windows 10 S. Unlike the standard full version of Windows 10 that most laptops come with, this one is running only the S edition. What this means is that it cannot run any apps that are not inside the Windows Store. Say you’d like to download a third-party app like Google Chrome, too bad. It’s not happening because it’s not in the Store. There is a decent variety of apps in the Store like, Facebook, Hulu, Netflix, etc… But most of us have bigger demands than just the major apps that are commonly accessible from all platforms. I like the idea of having Windows 10 S as an option. This is acceptable if you are going to be buying a budget laptop and to save a few dollars you decide to use the S version instead of the Windows 10 version, that’s fine. Or if you have a student that uses the laptop and you don’t want them downloading various malware programs, then you’re covered. You also cannot use any .exe files. However, this isn’t your budget laptop. This is a $1,300 USD laptop, and the idea that you cannot even install Google Chrome is a no-go for many users. The good news is that you can upgrade to the full version of Windows 10 Pro for free. You better get on that fast though, because that offer is only valid until the end of the year. After that, you will need to drop $50 to upgrade it. Inside, the Surface Laptop has some fairly standard specs. 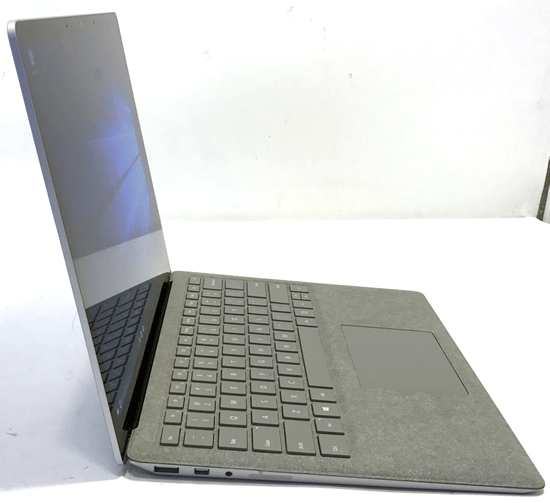 For a mid-tier level Surface that will cost $1,300, you get an i5-7200U processor with 8GB of RAM and a 256GB SSD. That’s literally the exact same specs you can get in the LG Ram, which also happens to cost a couple hundred dollars less. If you’re willing to spend more you may also want to look at some MacBooks as more powerful alternative. That’s of course if you don’t hate Apple. 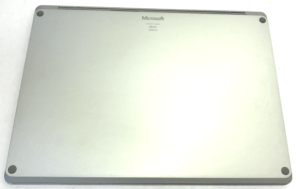 The display is a 13.5-inch with a kind of strange 2256 x 1504p configuration. What that means is, that’s it’s’ actually a really nice display. Not only is it sharp and have really nice color, contrast, viewing angles, all the standard stuff, and to top it all off, it’s a touch screen. The audio also sounds fairly decent given how small the speakers are on this laptop. The keyboard is also pretty solid without too much center flex. It has nice tactile feedback and feels snappy enough to get you by. 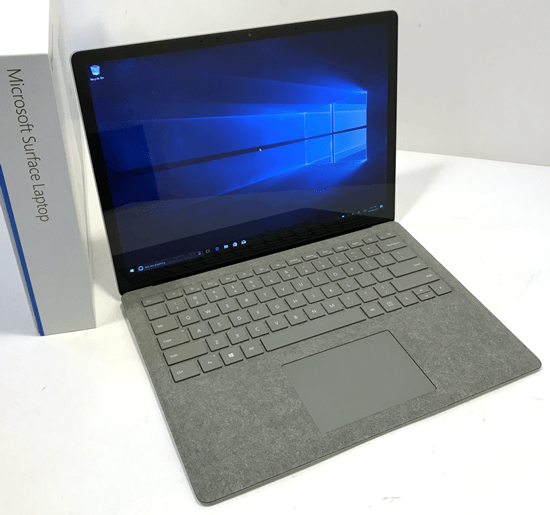 It actually feels very similar to what you’d find on the Surface Pro 4 Type Cover, and that’s a good thing. Some people with their touch screens prefer to use those over the trackpad. But in this instance, the Windows drivers trackpad is well built. It feels nice and handles all of the multi-gestures really well. This definitely is not a gaming PC, but if you like the play lower demanding games that you aren’t going to be very competitive with, then, in a cinch, you’ll be OK.